Jolly, thanks for this great presentation.. 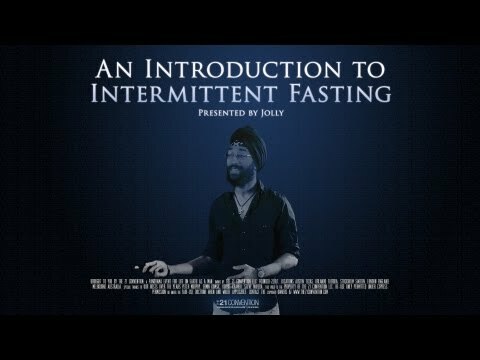 I have two questions that I want to clarify from your speech.. 1) How often do you do the intermittent fasting: ie is this 24hr or other forms of fasting something that you do once a week, a month? Whats the optimal frequency? By the way, I am already on primal/paleo diet as well.. 2) During the fasting period is it okay to drink? If so, what can you drink just water or more? Many thanks again for the awesome talk.. I generally do 24h fasts, about 2x a week. I'll do shorter (till lunch) type fasts without thinking about it. Frequency and length depends on your goals! 2) You can drink, just not anything with carbs or protein. I tend to drink coffee, water, or tea. Hello jolly. I really liked your presentation. I would like to loose weight & be more smarter like you. I do a 24hr fast everyday & then have anything i want for dinner within 1 hr window to eat. I have not really lost much weight. . I also started taking coconut oil with my dinner but found that i gained weight with that but liked how i felt. Please advice. Sam Harbi is an Online fitness coach & personal trainer in vancouver that teaches intermittent fasting for women with vega protein weight loss training program. <g>Hi ladies & gents, I read this article and I got some awesome ideas, thank you <g>sir</g>!</g> I just want to share a nice blog about the diet coach Sam Harbi which is an Online fitness coach & personal trainer in Vancouver that teaches intermittent fasting for women with vega protein weight loss training program, it's interesting that her intermittent fasting results <g>are</g> indeed fantastic! <g>Hi,</g> I just want to share a nice blog about the diet coach Sam Harbi which is an Online fitness coach & personal trainer in Vancouver that teaches intermittent fasting for women with vega protein weight loss training program, it's interesting that her intermittent fasting results <g>are</g> indeed awesome! Amazing presentation! I have an important question, I posted it on the youtube video but I will rewrite it here. How can I make sure my brain is performing the same way as it would on sugar or carbs, i.e. fast, responsive, alert and sharp? I am on a course of 2, 4 Dinitrophenol to lose weight quickly. Last year I lost about 1lb a day, 39lbs in 49 on-cycle days on a 2 week on 1 week off schedule. It makes your body specifically use fat as the main source of energy, and you do notice it so much after a while. You start to think slowly and react slower to things, it's like you have consumed some alcohol. When I off-cycle and my body re-adjusts to all macronutrients then sugar and other carbs massively improve my alertness and ability to think quickly and sharply. There was a program called 'horizon - fat v sugar' which actually proved this in a fairly accurate way. The program had twins, and one of them consumed only fats, the other only sugar, and then they had a practise at day trading in a simulated environment, the sugar guy performed better. I have a less important question on the video about butters and why you use one with less sat fat as opposed to others which have more. Edit: Just noticed this blog post was 2 years ago but I watched the remastered video added 3 days ago. Thus my comments are on the new video. Loved your video, trying to get my head around coffee,mct and butter mix. Is that some sort of super food to keep ketosis going, to prevent hunger pains when you fast for the next several hours? Absolutely great inspiring presentation. Thanks, but what is MCT oil? Has it gor a product name what do I look for on the shop shelf? saw your Vid on Youtube which really got me interessted in IF and espacially your Coffee! I'm interessted in the biochemical processes involving MCT Oil, Kerrygold Butter and Coffee as a comination. Do you really get all the health benefits from IF, even though you consume those calories. I'm doing the 16/8 protocol and am very much pleased with it. Since I work out heavy and have a 12-shift job, those calories would be a great option! If you find time to explain the biochemical science behind it and maybe gibe me a hint to some studies proofing the whole thing I would be very grateful. Unfortunately I have not found any studies on PubMed concerning this subject. Your story is bit similar to mine. I started with GNC London-UK, as a supervisor in late 2010 as there are no franchises here in the UK and then got thru pretty much everything you described. Came across IF only a couple of months ago and actually would love to hear your opinion on meals that count during IF. Or better said, meals that don't count. Could you please share some of light into what doesn't count as a meal during IF? Some channels suggest that MCT don't count as a meal at all and it's good to have them in 15 -30g doses mornings and evenings without 'breaking' your fast. But then after all you get 9kcal per 1g of MCT...so where's the sense in that. You see my point? I'm lost there...thanks for any information. Cool speech. Your a good speaker, very confident.